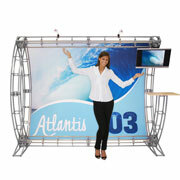 A full range of modular and portable trade show exhibits and booth systems in a large array of sizes. Each brand and design offers its own unique features for graphics, set up and accessories. 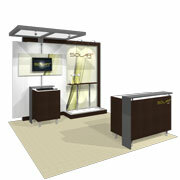 Custom trade show exhibits are also available. If you have any questions about choosing the right trade show booth for your exhibiting needs please call us toll free at 1-855-536-3385 or contact us by email. Modular exhibits are designed and put together from systems of prefabricated components. It's easy to create an exhibit tailored exactly to your needs. The latest trend in exhibiting is here! 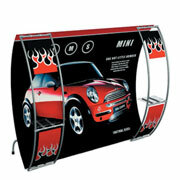 Tension fabric displays use beautifully printed stretch fabrics to create a smooth, modern look. 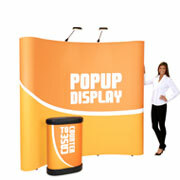 Portable, lightweight, easy to set up, pop up booths are still the most popular choice for exhibitors on a budget. Find the top brands here! 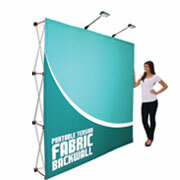 Create a backdrop for your exhibit space with a simple to carry backwall display. Great for most special events and retail interiors. For sheer strength and versatility nothing beats a trade show truss exhibit. Create your own design or choose one of the kits. 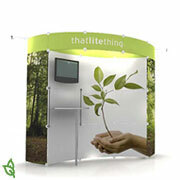 Exhibit and booths made with sustainable materials and designed to be environmentally friendly. Learn how choosing green can benefit your business.